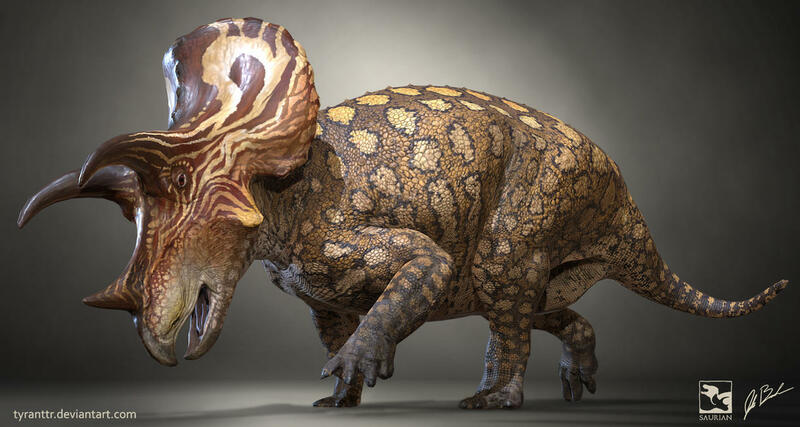 Triceratops and Tyrannosaurus are not only the two most iconic and famous dinosaurs, but also the ones that the Saurian team has happened to change the most. Let's look at the most recent model for each of the two genera and see how accurate they really are. Here's the most recent iteration of the Triceratops prorsus ontogenetic cycle. It's pretty accurate for the most part except the adult's horns curve forward too much. Again, it's very accurate. The male was likely more colorful than the female to attract a mate. Females were likely more dull. Overall, the Triceratops is very accurate. I give it a 9/10. Onto the Tyrant King. We only have these two stages of the T.rex life-cycle so far. The baby is hella inaccurate, because of its lack of feathers. The adult is mostly fine, except it's a little too thicc and the tail should be longer. Both shouldn't have lips, however. Overall, I give the Tyrannosaurus a 7/10. Overall, the two mascots of Saurian are for the most part very accurate, although they could use some improvements here and there. The T.rex is less accurate though, and it definitely needs some work.